Records show that the role of military pioneers was established in the early 17th century, and perhaps earlier. They were originally attached to the artillery branch, but under the direction of the engineers, and they were responsible for creating the means to move and place field cannons in active warfare. Their role was to create roads, probably better described as tracks, and to open up areas near to the fighting so that the teams of horse drawn cannon could quickly get into position to support the infantry. Infantry could move quickly, at the whim of officers far behind the action, and the artillery had to keep pace or risk catastrophic results for the foot soldiers. In addition to road building, they were also responsible for the establishment and repair of offensive and defensive battlements and fortifications, entrenchments for men and munitions to have cover and shelter, secure areas for teams of service animals such as horses and mules, and perhaps most importantly, they provided carrying parties to get food and equipment to the forward area and to get the wounded back to the rear. Much of this work was done in front of or alongside the advancing infantry and artillery. These men were invariably in harm’s way. 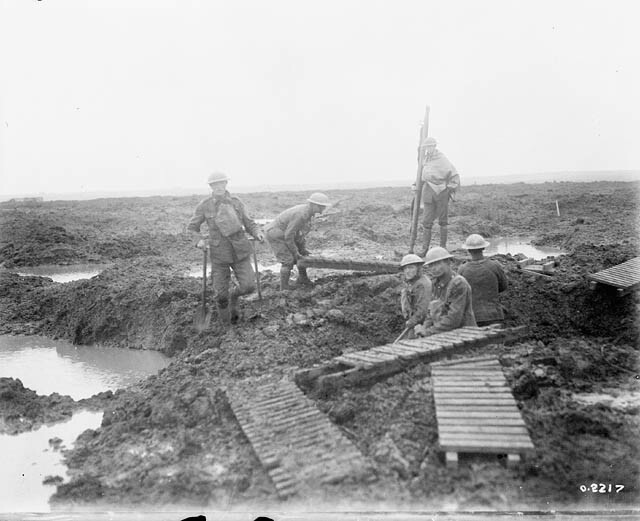 Canadian Pioneers laying trench mats over mud. Battle of Passchendaele. The make-up of the pioneers evolved over the following decades such that they became hard-working and intelligent men, coming under the military structure of the Engineers branch of service, and in addition to the traditional activities of pioneers, they undertook more engineering functions such as bridge building, setting of foundations upon which they erected buildings, and undertook civil construction works such as diversion of watercourses to get water nearer the fighting troops, and the drainage or mitigation of boggy areas. 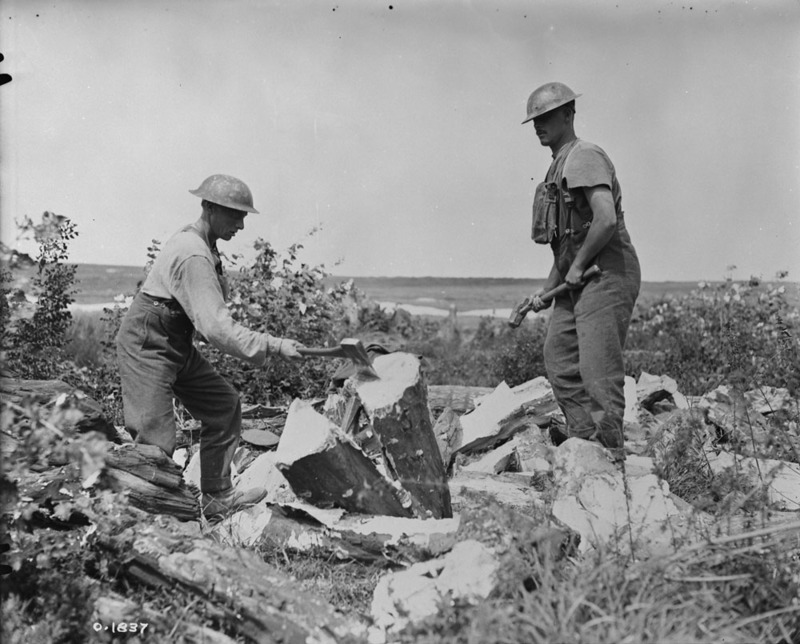 Canadian pioneers splitting logs for use in trenches. August, 1917. 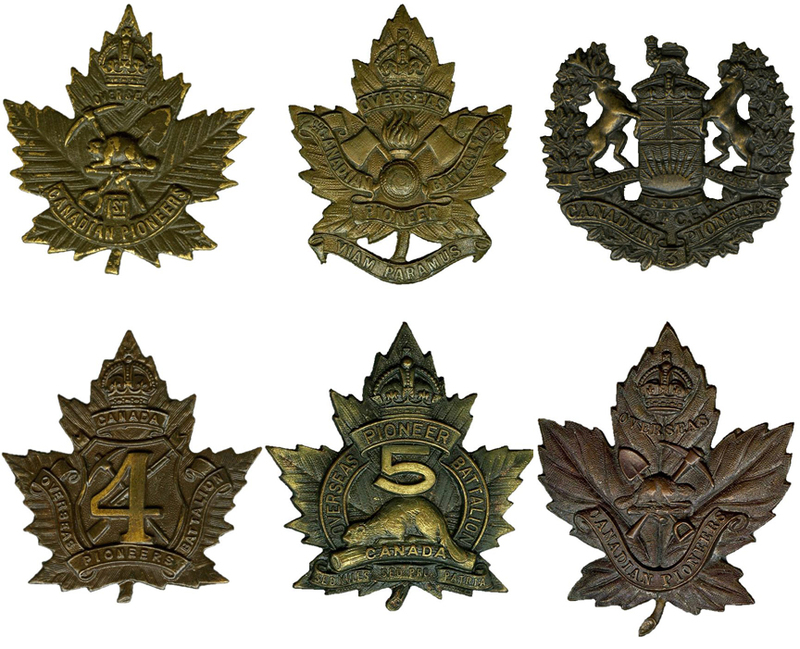 When the Great War started in August 1914 Canada’s permanent military force was small, made up of a small number of infantry, cavalry, artillery and engineers. Canada had no navy at the time war broke out, and relied on the British Navy for protection on the high seas.Canada did, however, have a relatively large militia, having many seasoned soldiers who had fought as British forces in prior conflicts. However, many militia regiments in Canada were more social than military in nature, and although they had training in marching and other drill exercises, and musketry, they were not trained in military tactics. Each infantry battalion had a small number (usually 3 or 4) of trained pioneers, but there were insufficient numbers of pioneers to do any substantial work. 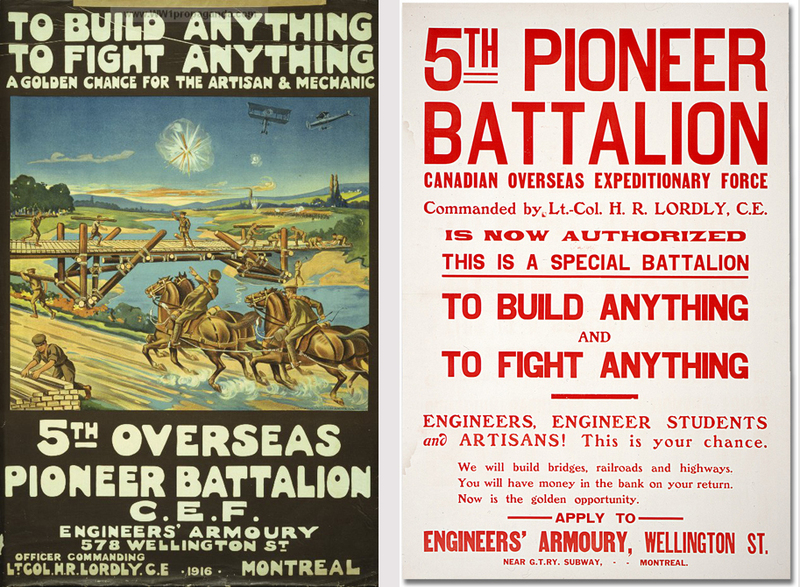 Recruiting posters produced by the 5th Pioneer Battalion, CEF. 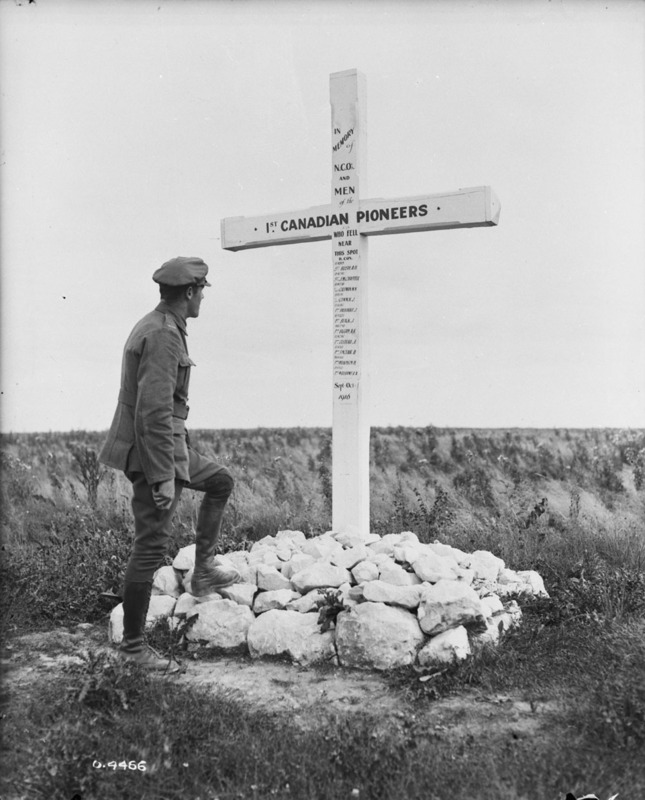 The Canadian Pioneer Battalions were not raised until 1915, and even then, three infantry battalions that had been raised and trained in Canada, arrived in England and completed their training as infantry battalions, were converted to Pioneer Battalions shortly before mobilizing to France: the 48th Infantry Battalion became the 3rd Pioneer Battalion; and the 124th Infantry Battalion became the 124th Pioneer Battalion. The 123rd Infantry Battalion, Royal Grenadiers, was also re-purposed as the 123rd Pioneer Battalion, Royal Grenadiers. 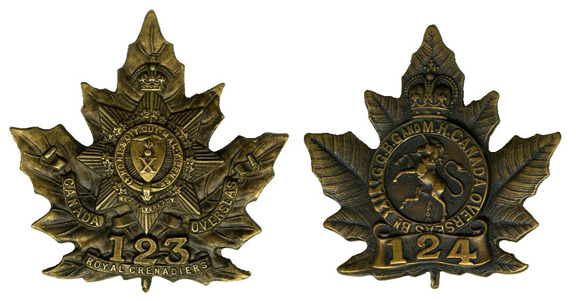 The 123rd had the special distinction of having the name of its home Regiment officially included in the name of the Battalion, with the blessing of the King. A book is currently being written about the history of the 123rd. The men of the 3rd, 123rd and 124th were uniquely skilled, in that they were first fully trained as infantry soldiers, and then added the skills of pioneers and engineers to their strong foundation as fighting men. Understanding infantry tactics while performing pioneer duties no doubt reduced the number of casualties suffered by the pioneers. The Canadian Pioneers of the Great War served valiantly, some of whom were decorated for their bravery and conspicuous gallantry in the face of the enemy. Their officers were respected by the men who served under them, which often was not the case in infantry battalions, where the men were contemptuous of their officers. The Commanding Officer of the Princess Patricia’s Canadian Light Infantry (P.P.C.L.I.) became particularly fond of the men of the 123rd Pioneer Battalion, Royal Grenadiers for the services they rendered to the P.P.C.L.I. on battle fronts such as Passchendaele and Ypres. Memorial to 1st Canadian Pioneers, Somme. January 1918. Excellent article Dan, well done! Articulate, interesting and informative article. The differences in language usage and patterns are notable: “for mending the ways”. Great article Dan. Enjoyed reading it. I’m sure your book will be excellent. My Grandfather James Patten – was in the 123rd (124th G.G.B,G. (Pioneers) Cdns.- I have his picture wearing his spurs and a paper from his Lieut-Colonel (signature hard to read) giving his 14 days leave on the 23rd of March 1918 to Birritz.